Origin: Oriental fire-bellied toads are found in northeastern China, Korea, southern Japan and southern Russia. 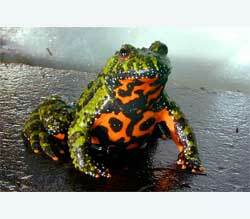 Habitat: Oriental fire-bellied toads inhabit ponds, lakes, swamps, slow-moving streams or ditches. The dorsum of these beautiful toads is bright green with black reticulations, and ventrally, they are bright orange, yellow, or red mottled with black. The dorsum is also covered with small warts. Oriental fire-bellied toads produce toxins in their skin and often dissuade potential predators by arching their back or flipping over and exposing their brightly colored bellies (termed the “Unken reflex”). Oriental fire-bellied toads are very hardy captives and make an excellent beginner pet. They can live up to 20 years in captivity. A basic 10 gallon aquarium is a good-size enclosure for housing up to a pair of these toads. It is important that the cage has both dry and wet components. Pea gravel should be avoided in the cage design, as it can be ingested during feeding. Spring water or dechlorinated tap water should be used in the aquatic portion of the enclosure. Temperatures should be maintained in the low to mid 70s degrees Fahrenheit. Prey in captivity should include crickets, small silk moth larvae, wax worms and earthworms. Gut loading the crickets is easily accomplished by feeding the crickets a mix of vegetables and a commercially available cricket diet for a period of 24 hours before feeding them to the animals. Food items should also be dusted with a vitamin/mineral supplement prior to feeding. When feeding adult Oriental fire-bellied toads, it is a good idea to dust crickets once weekly, while the food of the juveniles should be dusted at every feeding. These toads should be fed roughly three times a week to maintain proper body weight.